Le Lyrial sailed the Lemaire Channel late last evening, in perfect conditions, and sunset the jewel marking day’s end after midnight. In awesome wonder guests lined the decks and public areas incredulous at the scenery sliding by. High mountains and glaciers tumble haphazard into the ocean, whilst Bridge Officers navigate between numerous icebergs. Fujichrome Fjord or Kodachrome Canyon, as it is affectionately known, on an evening like this is jaw-dropping. Wonderful to see many guests soaking in the scene visually, realising that photography will never adequately capture this scene. Long-serving team members say this is the best Lemaire experience in 10 years, with Minke Whales in the bow wave, inquisitively viewing the ship and its occupants. The sunset seemingly got better and better. We are grateful that the narrow channel was not choked with ice, as is often the case, the Captain doing a superb job of taking Le Lyrial all the way through. Robert Browning, one of Shackleton’s favourite poets, wrote “I hold that a man should strive to the uttermost for his Life’s set prize”. This line is inscribed on the reverse of Shackleton’s gravestone at Grytviken. Considering how Shackleton strived to reach the South Pole and then attempted to cross Antarctica, the deprivations of previous expeditions having taken their toll, along with various health challenges and constantly changing his response to varying circumstances, I believe these words apply to him. Antarctica tends to inspire her visitors to reflect on their lives, especially at New Year, with thought regarding possible changes. After 3 days of exceptional weather down here, and a very calm Drake Crossing, fog and snow from very early this morning reminding us that Nature is in charge here, and changes take place very rapidly. We require changing our responses accordingly.The Expedition Team were up from 5am, scouting for whales, but by 8am, there were sadly no sightings or behaviour worth stopping for. Wilhelmina Bay is well-known for its whales, so this is most unusual. I took up a position on the outside rear deck, eventually taking cover from the snow on Deck 5, and very cold. After two hours coffee was calling loudly. The Lemaire last night more than making up for the different conditions this morning. With their sway-backed upright posture, smart black-and-white colouration and endearing waddling gait, Penguins are perhaps the most distinctive of birds. 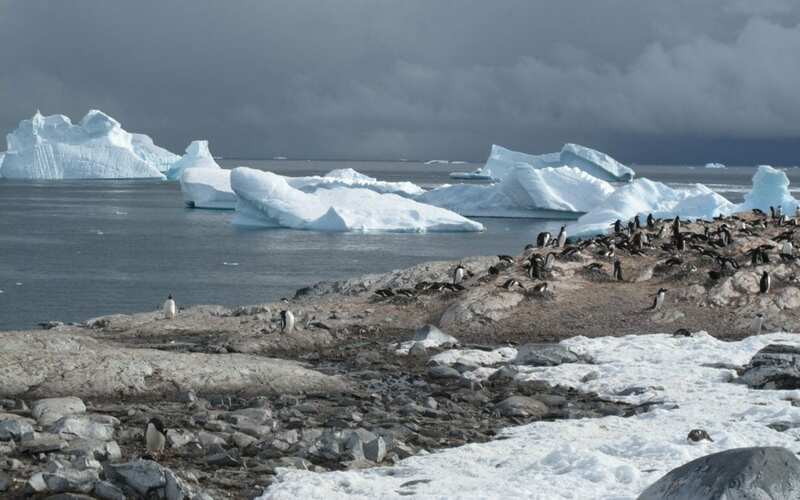 Only 4 species breed on the Antarctic Continent proper – the Emperor, Adelie, Chinstrap and Gentoo, whilst 7 other species live and breed south of the Polar Front defining far southern oceans. As Penguins are flightless and must feed in cool waters, they are unable to travel across warm, tropical waters to inhabit the northern hemisphere. Highly specialised, non-flying, marine birds ranging in size from the Little Penguin at 1kg, to the Emperor Penguin at 38kg, standing at 115cm (45 inches). The basic dark and pale colouration, repeated with variations, provides both protection from predators and camouflage when hunting. Being dark against a dark background, and white against a light background when viewed from below has many advantages for these emblematic birds of the Antarctic. Their feathers have modified from flying equipment into waterproof insulation, thickening the birds outline, and shaping them to hold air against the body. Swimming compresses the feathers and gradually forces out the insulating layer of air, so that swimming Penguins emit a fine trail of air bubbles. Indeed, they fly in their watery environment! Morning activities comprised Zodiac cruising in Charlotte Bay. Discovered in 1897, and named in honour of Georges Lecointe’s fiancée, executive officer, hydrographer and 2IC of de Gerlache’s expedition. Like the Adelie Penguin named after Dumont D’Urville’s wife, these men must have spent much time thinking about loved ones and sweethearts back home. Considered one of the most beautiful bays in the Antarctic Peninsula, confirmed this beautiful morning with low cloud, snow gently falling and the calm ocean a maze of stunning icebergs. Tiny Andree’ Island off to starboard of the ship, a more magnificent scene to explore by Zodiac is impossible to imagine. Drivers and guests alike donning extra layers for warmth. The ambient temperature is 0 degrees C (33F), and this will fall once the wind chill begins on moving Zodiacs. This is the “other face” of Antarctica, and what a wonderland it is out there this morning. Plenty of Humpback Whales were seen by both groups, and clearly everybody had an awesome tour. I was able to catch up with the blog, and some emails. Lunchtime found guests enjoying the southernmost barbeque in the world in La Comete restaurant upstairs, snow falling steadily beyond the windows. Le Lyrial sailing north towards Hydruga Rocks. Unfortunately high winds and constantly falling snow put paid to our plans for Hydruga Rocks, and we sailed to Mikkelson Harbour instead. I teased Matt Messina who left his expensive camera and lens on a chair when we all boarded the scouting Zodiac. Always smiling, Matt takes a teasing very well, and has asked to be mentioned positively in the blog. After I mentioned his swim at South Georgia, his family have been ribbing him too. Mikkelson’s sheltered harbour was favoured by whalers and sealers in days gone by. With plenty of wind and a choppy sea, we made our way to the landing site, which had to be approached very carefully – plenty of rocks and low tide. The Expedition Officer carefully placed buoys to guide the Zodiac drivers on their approach and exit from the landing site. An old whaler’s water boat, and large numbers of massive whale bones littered the beach. An adult male Weddell Seal looked on unconcerned, as Larry and Matt explained the various bones to interested guests. The size of the skulls, vertebrae and rib bones was staggering. Skuas provided somewhat macabre interest by stealing and devouring Penguin chicks from the Gentoo colony. They wolf a chick down in large pieces, usually being hounded by other Skuas for a share of the spoils. This afternoon, guests and team alike felt some of the bite of the keen Antarctic wind. It was very cold, and most were looking forward to a warm shower and hot soup when we got back to Le Lyrial around 7.30pm. Larry, particularly as he had stepped off the Zodiac into water deeper than his boots, and spent the afternoon with two wet, frigid feet. Trinity Island provided a gorgeous backdrop with steep, ice-covered slopes running into the sea. Tonight we sail northwards, to King George and Penguin Islands – our intended visits for tomorrow.